sample image 2CV old, box sill entrance protection out polished high-grade steel. sample image Fender rear, stone guards (1 pair) at the rear side of the rear fenders. These stone guards corners take up also the taillight. Suitable for Citroen 2CV to year of construction 1963. Material: Aluminum casting poilished. sample image 2CV, Fender rear, stone guards corners (1 pair) at the front of the rear fenders. 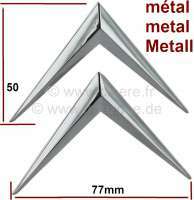 Suitable for Citroen 2CV, all years of construction. Material: Aluminum casting polished. The stone guards are supplied inclusive mounting material. sample image 2CV, Fender in front, stone guards (1 pair) rear, at the front fenders. (Above the mud flaps). 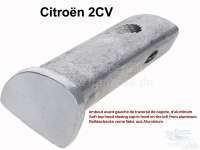 Suitable for Citroen 2CV, all years of construction. Material: Aluminum casting polished. The stone guards corners are supplied inclusive mounting material. sample image 2CV, Fender in front, stone guards (1 pair) underneath the indicators, for the front side of the fender. 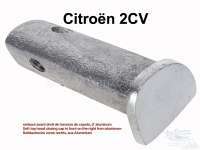 Suitable for Citroen 2CV, all years of construction. Material: Aluminum casting polished. The stone guards are supplied inclusive mounting material. sample image 2CV, Soft top hood closing cap in front on the left from aluminum casting. Note: Only suitable for 2CV with roll roof buckle outside!. Bore for the connector must be adapted depending upon year of construction. sample image 2CV, Soft top hood closing cap in front on the right from aluminum casting. Note: Only suitable for 2CV with roll roof buckle outside!. Bore for the connector must be adapted depending upon year of construction possibly. 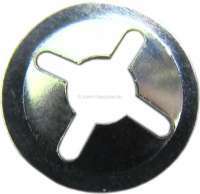 sample image Indicator - chrome ring for the front indicators (2 fittings), for Citroen 2CV. 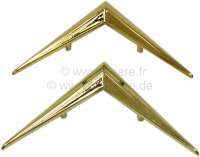 Also suitable for the back lights Citroen AZU, AK400, DS BREAK, HY. Own reproduction. Anodised aluminium. sample image Chrome polish Autosol. 75ml tube. sample image F-emblem, aluminium casting, with base to screw on a bumper. 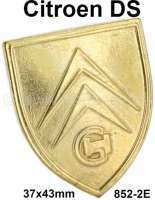 sample image Retaining tie-clip for emblems. Suitable for 3mm pins. Per piece! sample image License plate handle from chromium-plated synthetic. Suitable for all license plates, who are 520mm wide! sample image Number plate holding plastic with stainless steel cover frame, suitable for every number plate with width: 520mm. Outside 135x530mm. 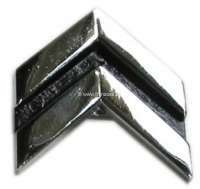 sample image Bonnet handle for Citroen DS. The handle is from polished aluminum casting. The bonnet handle can be mounted also onto a Citroen 2CV.